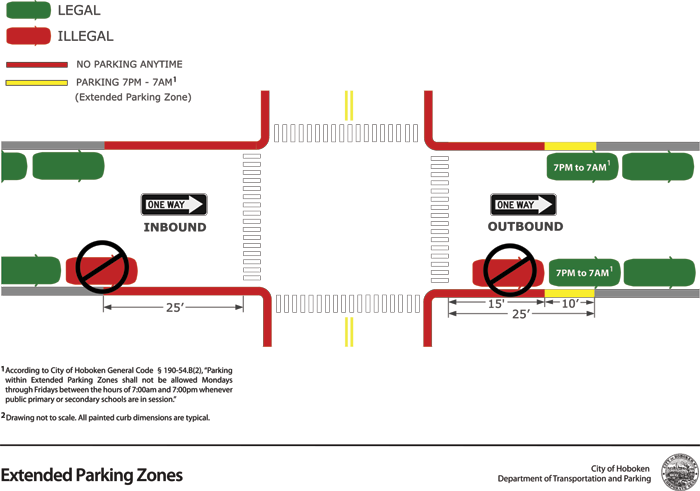 Outbound Leg: The roadway segment connected to an intersection, or portion thereof, that permits a vehicle to be driven away from an intersection in accordance with the legally established direction of traffic. B. Vehicle may park in Extended Parking Zones subject to the following:1. Vehicles in Extended Parking Zones shall at all times comply with all other parking regulations, including but not limited to regulations on parking permits, street cleaning, and parking along emergency snow routes;2. Parking within Extended Parking Zones shall not be allowed Mondays through Fridays between the hours of 7:00am and 7:00pm whenever public primary or secondary schools are in session.